U.S. Secretary of the Interior Sally Jewell Wednesday designated 24 new National Historic Landmarks, including Chicano Park in San Diego. The park was the site of Latino community protests in 1970 that halted construction of a California Highway Patrol office on Barrio Logan property that the city had promised to use as parkland. The park was eventually built under the mainland end of the San Diego- Coronado Bay Bridge and is now the site of numerous community festivals. A bill introduced by Rep. Juan Vargas, D-San Diego, that called on Jewell to study whether to make the park a landmark passed the House of Representatives last year but wasn’t taken up by the Senate. He reintroduced it last week. 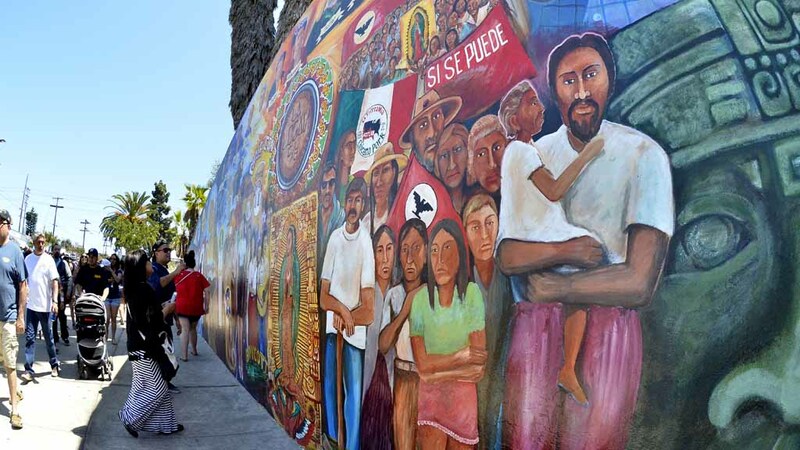 “The designation of Chicano Park as a National Historic Landmark is incredible news for the community of Barrio Logan in San Diego, the future of the park, and the many activists who throughout the years have advocated for a space where families can gather and where people can celebrate their shared cultural heritage,” Vargas said. The park is part of the San Diego City Council district represented by David Alvarez. — Our Lady of Guadalupe Mission Chapel in San Jose, a key site in the Mexican American civil rights movement. According to the Interior Department, the landmarks program recognizes “historic properties of exceptional value to the nation” and promotes the preservation efforts of federal, state and local agencies and Native American tribes, as well as those of private organizations and individuals.